Recology San Francisco is pleased to announce recipients of artist residencies for 2016. The six selected artists are: Miguel Arzabe, Ramekon O’Arwisters, Kate Rhoades, Weston Teruya, Anja Ulfeldt, and Sherri Lynn Wood. During each four-month residency period, two artists share an on-site studio and scavenge in the Public Disposal and Recycling Area for materials to make their art. Exhibitions of completed work are held at the end of each residency. This was the most competitive year to date, with 140 artists applying for the six residency positions. In video, painting and publications, Kate Rhoades uses humor and the absurd to talk about complex ideas. Past work has lampooned the art market and skillfully distilled dense art theory into spot-on comical vignettes. For her Recology residency, Rhoades will use the Jim Henson film Labyrinth as inspiration, loosely continuing the Junk Lady scene. Expanding her puppetry and animation skills, she will make sets, puppets and costumes for video works that address overconsumption, illusion and the effects of materialism on relationships. 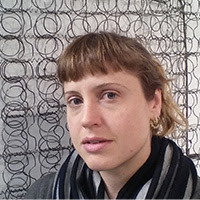 Rhoades holds an MFA from Mills College and has exhibited in the Bay Area at Root Division, Southern Exposure, di Rosa, the Berkeley Art Center, and the David Brower Center. Weston Teruya makes paper sculptural installations that examine the social dynamics, textures, and histories of specific sites and communities. On first glance, his installations appear to be groupings of assorted objects, but a closer view reveals each item to be a carefully constructed paper sculpture, with groupings representing symbolic relationships. Residency work will address San Francisco’s current social and cultural landscape, using the city’s discards to talk about change and displacement. 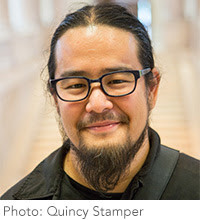 Teruya has exhibited at the Mills College Art Museum, Yerba Buena Center for the Arts, and the Headlands Center for the Arts, and is the recipient of a Montalvo Art Center Irvine Fellowship. He holds an MA in visual and critical studies and an MFA in painting and drawing from the California College of the Arts and is represented by Patricia Sweetow Gallery in Oakland. Miguel Arzabe works across media to investigate agency, perception, and goal-oriented thinking through playful experimentation. Obliquely informed by his background in engineering, his work in painting, video, and paper weaving posits human intervention against the physical properties of matter. Arzabe will make a multi-channel video installation that will use the purely formal characteristics of the materials in the waste stream as a point of departure. Found objects and house paint will become subjects for abstract video works that will appear like moving paintings. Arzabe holds an MFA from UC Berkeley, and has been the recipient of a Kala Residency, a Montalvo Art Center Irvine Fellowship, and a Headlands Center for the Arts Graduate Fellowship. His work has been exhibited locally at the San Francisco Arts Commission Gallery and Cult Exhibitions, and in Paris at the Centre Pompidou. 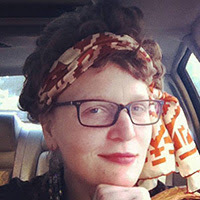 Sherri Lynn Wood employs fiber-based craft techniques to create experiential objects and environments. Her goal is to activate rhythms of attention, such as bereavement, trance, devotion, curiosity, and surprise in participants and viewers. During her residency, she will make a series of patchwork quilts for a forthcoming book focusing on the imaginative practice of making do. 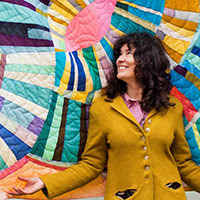 Wood’s project responds to the 3.76 billion dollar quilting industry that encourages quilt makers to consume rather than reuse, and will be a follow up to her publication The Improv Handbook For Modern Quilters. Quilts will illustrate different aspects of patchwork, such as working with architectural features, texture, or clothing that carries memory and meaning. Wood is the recipient of a Joan Mitchell Foundation Grant and a Headlands Center for the Arts Residency. She has exhibited locally at Electric Works Gallery and the San Francisco Museum of Craft and Folk Art. She holds an MFA from Bard College and a Masters of Theological Studies from Emory University in Atlanta. 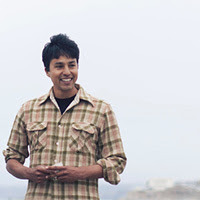 Ramekon O’Arwisters is a social-practice artist who creates collaborative, community-based projects infused with folk-art traditions that foster a culture of community building. One such project, the Crochet Jam, is an on-going rag-rug making event that allows participants to work together on a piece of art with a focus on liberation, relaxation, and human connection. During his residency, O’Arwisters will hold a Crochet Jam using found fabrics, while also scavenging materials for sculptural works. O’Arwisters holds a Masters in Divinity from Duke University in Durham, North Carolina. He is the recipient of a Eureka Fellowship, two San Francisco Arts Commission Individual Artist Grants, and a Djerassi Residency. His work has been exhibited locally at venues including the de Young Museum, the Museum of the African Diaspora, and the Luggage Store Gallery. As an interdisciplinary sculptor and durational installation artist, Anja Ulfeldt works primarily in time-based media with a focus on large-scale installation and non-commercially oriented artworks. While at Recology, she will create a gallery of reanimated furniture and possessions that will function as altered or disfigured infrastructure. Work will explore the relationship between home, relocation, adaptation and identity, and will incorporate sound and movement. 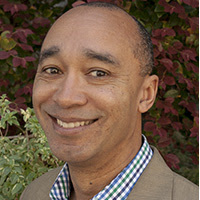 Ulfeldt holds an MFA from Stanford University. Her work has been exhibited in the Bay Area at Root Division, KALA Art Institute, and Pro Arts Gallery, and in Salzburg, Austria at Mirabel Gardens. In 2011 she was an artist-in-residence at the Exploratorium. The Artist in Residence Program at Recology San Francisco is a one-of-a-kind initiative started in 1990 to support Bay Area artists, while also teaching children and adults about recycling and resource conservation. Over 120 professional Bay Area artists have completed residencies. Applications are accepted annually in August and resident artists are selected by an advisory board composed of art and environmental professionals and peer artists.